The Able2Sail Sailing Season 2017 was incredibly successful. Able2Sail and Jenny Rose both berthed in Kip Marina were used every weekend and often through the week (weather permitting) from April until September to allow a variety of sailing experiences on the Clyde. Longer journeys which included overnight stays for the Youth Forum members and Duke of Edinburgh participants saw the young people stay at different marinas and at anchor in beautiful parts of Scotland. The Youth Forum also sailed at Castle Semple Clyde Muirsheil Park learning dinghy and powerboating skills. The young people were identified through liaison with carers, various Social Work departments and Kilpatrick School as those who would benefit most from small sailing experiences through to achieving a range of nationally recognised RYA awards. The carers mostly came with their young people to share their time on the modified yacht and motor cruiser. They shared, with the volunteers, time on the water , tea breaks and sandwich lunches. The carers for the Youth Forum participants were able to come to training sessions, Regattas and see how their young people were progressing or use their time for other family matters. A new electric hoist was purchased which allow young people with mobility issues access to the yacht. We covered priority areas Complex Needs, Sport & Active Leisure, Independence, Transition to Adulthood and Diversity. Four of our young people represented Scotland West at the Special Olympics Sheffield 2017 the first time Scotland has been represented in sailing. They achieved 2 Silver and 1 Bronze Medal. This team were subsequently awarded RYA Sailability Team of the Year 2018 beating very stiff competition from the UK and abroad. 103 have had a sail on either yacht or Jenny Rose, 14 experienced success in small boat sailing, 6 had sails of 3 days with 2 overnights, 4 had a training schedule and will represent Scotland West at the Special Olympics. 3 undertook the Duke of Edinburgh Expedition, Participation in RYA Regattas. All the above outcomes were achieved and indeed exceeded. The numbers of young people taken out was increased. The Youth Forum members achieved a variety of RYA certification from Bronze Sailability Award to Day Skipper. They participated in and won two multi-class RYA Regattas at various locations across Scotland. 10 of the young people had sails of 3 days with 2 overnights on board the yacht and motor cruiser together. The crews met up each night to have a social debriefing and evening meal. The Special Olympics experience was outstanding with the young people leaving Scotland in a team bus with the other competitors. They were in the Olympic Village for a 5 days and after several days of competition against some very experienced sailors achieved 2 Silver and 1 Bronze medals. Many family members went to the Games. The Duke of Edinburgh Expedition was undertaken with the practice sail (3 days) having fair winds and sunshine, unfortunately the weather for the assessed sail was poor and challenging. Lewis aged 14 years and a pupil at Riverbrae School in Linwood. Lewis previously attended Kersland School in Paisley and was a pupil there for most of his primary school days. The new school at Riverbrae is the amalgamation of Kersland and Clippens Schools and Hollybush Nursery. All of these establishments catered for pupils with additional support needs. As well as the barriers to learning that he may face, he was diagnosed with diabetes a couple of years ago. This condition is challenging enough on its own but again he manages this well, taking responsibility for the delivery of daily insulin injections required. He also demonstrates a great deal of responsibility accepting the condition and realising that his diet is important to the day to day management of his diabetes. 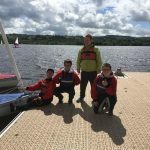 Lewis first started sailing at Castle Semple with the help and support of Able2Sail just over 2 years ago. When asked to participate with the sailing programme which was delivered through a school curricular activity, he jumped at the chance to try something new. His skills have improved rapidly and he has now taken part in regattas, representing the school and West of Scotland recently at The Special Olympics at Sheffield in the summer of 2017. He is a committed and determined young man in the lead up to the Olympics, spending a lot of his free time at weekends to train for the Games. Lewis has become a bit of a hero in his school but he is a very modest young man for all that he has achieved. His success in gaining a silver medal at the Games was recognised when he won the Renfrewshire Council's Young Sportsperson of the Year. Above all, the participation with Able2Sail has offered him the chance to make new friends and has increased his self esteem and confidence in the process. We will continue to work as a team and look forward to participating in many more competitions in the future. Carers of 117 young people will have had a relaxing time with their young people on a sailing opportunity, or will have had quality time when their young person is undertaking a sailing programme. They will have increased well-being as a result of their participation in a mainstream activity. The carers reported enjoying their time with Able2Sail often asking for more sails and looking forward to next year. They were encouraged to participate as much as they wanted in the actual sailing process or just enjoy their time on the water The introduction of a simple feedback/evaluation form has helped us gather comments from almost 50% of our sails this season. The form was easy to use and was completed without any difficulty, there is scope however to improve on the number of forms completed throughout the season. What was clear was that some families embraced the opportunity to sail with us and spend quality time together with their families. The value of this cannot be underestimated. Regular phone calls and meetings with parents of the Youth Forum members ensured that all information was disseminated at the same time. This has been further improved with a “whatsapp” group for the Special Olympics Team being set up. The carers of 117 young people will, have had the opportunity to participate in either yacht cruising or motor sailing, if they choose to identify another person to accompany their young person, will have the opportunity to use the time freed up by sailing to use as they see fit. The carers were asked to complete a simple evaluation form at the end of the sail. Comments included, ‘‘Today was a great experience that as a parent I could share with my son. We were both made to feel very welcome and not a stranger. Great team of people would recommend to others’’ ‘‘Doing this has lifted our spirits, sitting back and enjoying an excellent lunch – all so unexpected. A day of carefree activity! !’’ The parents/carers of the Youth Forum members were invited to a celebration of achievement The young people were presented with their certificates, badges and a celebration tea was served. 117 carers will have had a sailing opportunity with their young person. All on-board will be encouraged to participate in the sailing aspects such as helming, setting sails, use of on-board technology. Carers will meet new “friends” as a result of sailing experiences and social event. Representation, attendance and participation in Sailing Regattas, 4 young people will have attended the Special Olympics to represent Scotland West. This will have been the first time this sport has been represented by Scotland West. Success can lead to international involvement in sailing. Multiclass Regattas were attended at Clyde Muirsheil Park and Loch Lomond with the Annual Windward Trophy and Gold Medal in the Multiclass Regatta Hansa 303 being awarded. The young people represented Scotland West as the first ever Scottish sailors in the Special Olympics winning 2 Silver and 1 Bronze medal. They attended the 7 days in the Olympic Village Sheffield. They were subsequently chosen as RYA Sailability Team of the Year at an RYA Sailability conference beating a very strong fleet from the UK and abroad. In February they were chosen as the GB Team for the World Games in Abu Dhabi 2019. 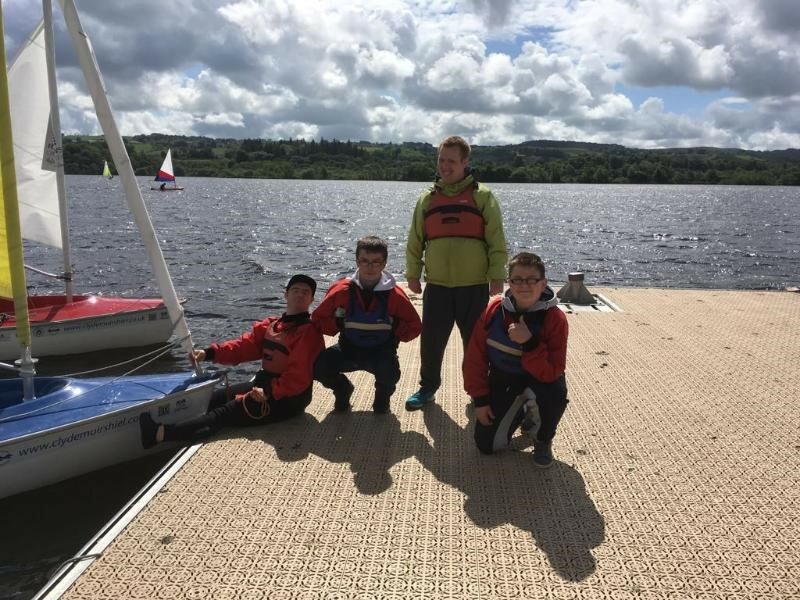 Able2Sail Youth Forum had three teams who competed in the dinghy sailing event at the Special Olympics in Sheffield from 7th to12th August for Scotland West. The teams were Jamie Kearns and his Unified Partner Darren McGregor, Lewis Nicholson and his Unified partner Mick Kelly, and Shannon McGhee with Laura Carrick as Unified Partner. These games were the first where Scotland competed in this dinghy sailing event and the only other competitors was a team of five pairs from the South of England. This English team was extremely experienced having competed at numerous events both at home and abroad. Our team of Jamie and Darren won the Silver medal having matched the best pair from England throughout four days of highly competitive racing right up to the last race which started with them equal on points with the top English team. Darren and Jamie attempted a risky overtaking move in the third leg of the last race which would have put them into the lead but unfortunately the boat capsized. The two Scottish boys righted the boat and continued the race overtaking two English boats to come from last position to a very credible third which secured Silver for the Scottish Team. Our two other teams comprising Lewis and Mick won a Silver in the Secondary competition with Shannon and Laura winning Bronze. The total medal position was : England 2 Gold, 1 Bronze, Scotland 2 Silver, 1 Bronze! Able2Sail were absolutely delighted with the team performance especially as we only learned some three weeks before the event that we would be competing in Wayfarer dinghies when all our training up to then had been in access dinghies. All of the teams capsized more than once during the four days of competitive sailing which they were not used to. However the team spirit prevailed and the competitors took it upon themselves to help each other and encourage those who had had a fright with the capsizing. A reduction in social isolation for families/ carers and young people by the uptake of sailing opportunities on a modified yacht and motor cruiser. Successful completion of the programme with happy enabled sailors and Able2Sail volunteers. The families were positive about their sailing experiences in their post sail evaluations. The requests for repeat sailings has increased during last season. The membership for the Youth Forum has increased despite some young people being over the age limit. Discussions are now taking pace to have a half-way point for these young people for whom volunteering for Able2Sail would not be an option but who really enjoy their sailing experiences and social interactions. There was a really good turnout by family members at the end of Season Award Ceremony. There was an amazing turnout at the Special Olympics to cheer on the Scottish Sailors.